If you want to live in a tolerant world, a just world and an equal world – join us. Help defend human rights via… email. Get the latest on our campaigns, events and wins delivered straight to your inbox. It’s the easiest and most convenient way to get involved. Sign up below. As an activist, you’ll be organising events and activities that empower people to take action for what they care about. As a volunteer, you will play a central role working with staff and other volunteers in our action centres to support activists. Sign up today. Donating regularly will create long-lasting impacts that support human rights in Australia and around the world. Donate today. 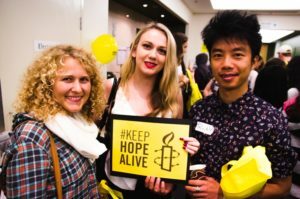 By becoming a member you can help define the direction of Amnesty. You can stand for board positions, join committees, and vote on important resolutions. Sign up. Australians call on the US to end a discriminatory travel ban on six majority-Muslim countries, and to uphold human rights.